Using a commercial tree wound product is not the correct way to treat most wounds to trees and shrubs. According to both Washington State University and the University of Tennessee agricultural departments, using commercial tree wound products do not stop rot or decay organisms. The products also do not allow the tree to properly heal and will hold in unnecessary moisture, which serves as a food source to pathogens. Purdue University does recommend the use of a fungicide or an insecticide when dealing with oak trees that may contain oak wilt disease. Remove any broken limbs back to larger mating limbs using either the pruning shears or pruning saw. Making clean cuts to any limb that requires pruning is the best method for treating any wound to a tree. In most all cases, the tree will naturally heal over the wound in time. Make the cuts as close to new bud growth as possible. Large branches must be taken back to the main trunk area. Do not make cuts to large branches close to the main trunk; instead, leave a few inches of the limb exposed. Cut any ragged bark edges into a smooth cut with the wood chisel. This also holds true for any wounds to the main trunk on the tree. The tree will naturally heal over the area. Haul away all cut material from the tree after pruning. Limbs and other debris will encourage insect and bacteria activity around the tree if left near the tree’s base or branches. Apply the manufacturer's label recommendations for fungicide and insecticides if you feel you must chemically treat the wounds to the tree. Healthy oak trees in the area of other oak trees that contain oak wilt disease, may benefit slightly from this type of chemical treatment, according to Paul C. Pecknold of Purdue University. All tree pruning is best performed when the tree is in full dormancy during winter. Trees that are pruned while in full leaf will attract insects and other diseases near the cut area. 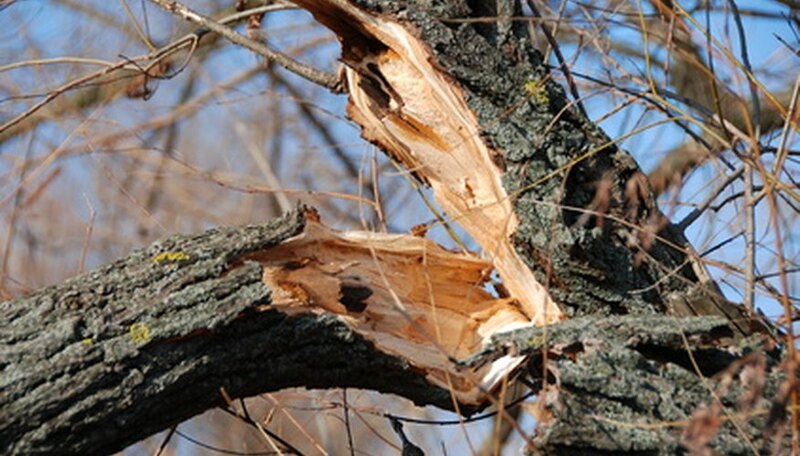 Consult a local arborist if the pruning is far from the ground, or if large sections of the tree must be removed. Keep children and pets away from any areas that have been treated with any type of chemical. Follow all labeling on the chemical container. Control runoff from chemicals as most chemicals will harm forms of aquatic life.